Yesterday I applied to Woocontest that awards a winner with $2000 and second runner with $1000 in cash. 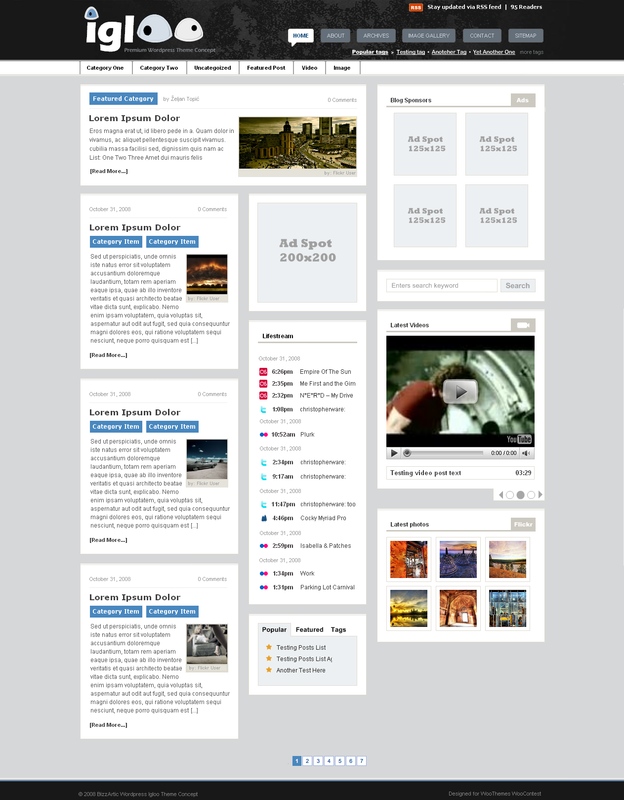 It is about designing a (WordPress) blog theme that would eventually be used as official Premium Woo Theme. The winner will be chosen according to the amount of positive comments it receives, as well as feedback gathered from guest judges (guest judges will be announced soon). The winner will receive $2000 and a 6 month develop license, whilst the runner up will receive $1000 and a 3 month develop license. Both will obviously grab a heap of exposure. We will then add some wordpress magic to the concept and launch it is an official WooTheme, crediting our winning designer. So please hit me with a positive comment if you think I deserve it: http://www.flickr.com/photos/19366836@N03/2932018815/in/pool-woothemes.